In May, we launched the Consulting Case Interview Bootcamp – Online. You have told us – over and over again – that you loved it. In June, we launched BBS – our once-a-year program for aspiring consultants to work together, as a group, to be the best that we can be. It’s almost July, and we’ve got big plans – MBA meet-and-greets and a 1-month consulting immersion course in South Africa. But today, we’re putting all of that activity on pause because we’ve completed a huge undertaking – the launch of the Consulting Fit Interview Bootcamp – Online. Over the years, we’ve made a huge discovery. What started off as a casual blog about management consulting with just a few readers became interview prep sessions, resume edits, videos on YouTube and Vimeo, books and the presentations we give at colleges around the world. And after all that, even with 1.5M readers, we’re still just getting started. Today, we’re pleased to announce the arrival of our Consulting Fit Interview Bootcamp – Online, a revolutionary new tool for people who want to break into consulting (or just get better at interviews in general). It’s only open for 3 days, so get it now! What Is The Goal of Consulting Fit Interview Bootcamp? You can read books or listen to others interview – you can go to company presentations – or you can just dream about breaking into consulting, but nothing offers the same level of clarifying, challenging, immersive teaching as the Consulting Fit Interview Bootcamp. While the case interview is the great equalizer, the fit interview is the great differentiator. Great experiences, top results, and a long list of achievements don’t stack up to a hill of beans unless you can weave a great and memorable story out of them. There is nothing more tragic than hearing after the fact from readers who fail to cross the divide, when they had everything it takes to work at the firm of their choice – and scored well on the case interview – but just didn’t prepare enough to demonstrate fit, or even more tragically, didn’t prepare in the right way. Why Is It Available For A Limited Time? Last year, 55% of our Black Belts got jobs at top consulting firms. That number is insane. They eclipsed the rest of the playing field. This course is our (much) cheaper version of Black Belt, but using the same methodology – break down the process, practice by yourself, and practice with a partner. To get the best results, you have to invest the time, and you need to start early. Being a Black Belt Interviewer is not just about pounding 10 cases – it’s about changing the way you think and talk. We could leave the course open, and you could buy it on a lazy Sunday when you have nothing better to do. But because that never ever ever happens, and it’s more likely that you’ll actually cram prep right before the interview, we’re setting a 3-day time limit to purchase the course. 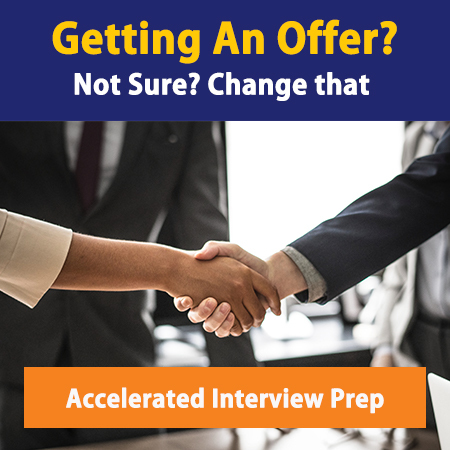 To be successful for an interview in September/October, you needed to start Case Interview prep last month and you need to start Fit Interview prep now. The investment is repaid in a lifetime of opportunities that would not otherwise have been open to you. The Consulting Fit Interview Bootcamp – Online is for anyone who wants to learn about business. The best consultants understand not just what is happening in a business, but also how to simplify key issues and measure the impact of potential changes to help complicated global enterprises flourish. If you have never opened an interview book in your life, or if you have practiced for 20+ hours, the Consulting Fit Interview Bootcamp – Online is what will take you to the next level in interview preparation. If you want to get a job at any of the top consulting firms like McKinsey, Bain, BCG, Oliver Wyman, KPMG, Deloitte, or one of 100+ firms that give ONLY fit interviews (like Analysis Group), this course is for you. If you’re still new to the world of consulting, this course is for you. If you’re familiar with interviews – even if you’ve practiced for 20 hours or more – this course is still for you. And yes – if you’re an experienced hire, an undergrad, an MBA candidate, an advanced degree holder or even someone who’s reapplying to their top choice firm (after not making the cut the first time around and waiting 2+ years to try again), this is for you. Even if you’ve done one of our 8-hour bootcamps – where you got the best interviewing foundation in the world – this course gives you the ability to review the concepts at your own pace and adds 32 days of homework to put your new skills into practice. In short – the only thing standing between you and incredible future opportunities is the consulting interview. This course is the most comprehensive preparation for fit interview questions available. How Will It Help Young Consultants? The Consulting Fit Interview Bootcamp – Online equips you with everything you need to solve any and every case that will get put in front of you. It takes you step-by-step through the complete fit interview process, breaking down every one of the 4 key questions and highlights how to build hero stories to answer the rest. There are 12 lessons with a teaching video (10-20 minutes). In every video, we give you key insights into what the interviewer is looking for in a strong candidate. Then, we included 12 example videos covering key consulting questions. Watching us coach someone who is pretty good at fit interviews through the entire process start to finish – and see how implementing our recommendations transform his skills. Take notes and apply everything he learns to your own consulting journey. In addition, we put 2 of our in-house interviewers head-to-head in 8 expert example videos. Watch them sweat as they solve cases on market sizing, profitability, market study and M&A. At the end of each session, we give you homework. You will find yourself getting better and better as you put our practical steps into action after each lesson. You will also find yourself starting to humble-brag with greater ease. Once you’ve completed the course, you will be able to walk into any interview, with any firm, knowing you’ve been prepared by the best – but more importantly – knowing that you have put in the hours and done the hard work to build top communication skills from the ground up. Why Purchase The Online Course? Breaking into consulting is nearly impossible. It is harder to get an offer at a top consulting firm than it is to get into HBS. You are up against thousands of supremely qualified candidates, and under 3% will be chosen. You have one chance to make an impression on a consulting firm. If you’re not successful, you’re locked out of re-applying for a minimum of 18 months. Don’t waste this opportunity. You need every edge you can get – make it count! The Consulting Fit Interview Bootcamp- Online is the best way to effectively prepare. To land the consulting job of your dreams, you need help knowing how to tackle the tough fit interview portion of the rigorous consulting application. If you want to be trained and equipped by experts in the field of consulting, this is the bootcamp for you. Nowhere else do you get a 360-degree learning environment. Watch other people walk through the fit interview process, see consulting experts tackle some of the hardest fit questions around, read about how to prepare your stories, and do activities and homework that are designed to perfect your fit interview skills. Do it at your own pace. Do it in the morning, do it at night. Work sessions on the weekends, do them every M/W/F. It’s up to you! Plus, unlike mock interviews with a representative of a top firm, you don’t have to wear a business suit. In fact, you don’t have to wear anything. If you think you have nothing to learn, do not buy this course. If you prefer to enjoy dreaming without preparing in reality, do not buy this course. If you will not do the homework, do not buy this course. If you care more about acquiring knowledge than applying insights, do not buy this course. If you like excuses more than action, do not buy this course. But if you want to win at the incredibly competitive consulting game, and you’re willing to go all in, this course is for you. When Is The Best Time To Buy The Course? Buy it now! For a limited time, you receive lifetime access for only $195. It is never too early to start preparing for case interviews. In fact, while you can prepare in as little as 1 week, we recommend that you start practicing a full 6 months in advance before your first interview. After completing a degree worth $200K, $195 is negligible – and in fact the best investment you’ll ever make – because the return is an immediate $10K-20K salary boost over other top jobs and $MM over your lifetime. Peak recruiting season is just around the corner – get started today! The Consulting Case Interview Bootcamp is only available until June 26, so to make sure you take this opportunity while it’s available and sign up here!